Plant reproduction i.e. 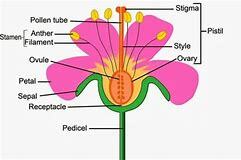 the production of new off-springs can be done both by sexual or asexual mode.In sexual reproduction the new plants are produced by the fusion of gametes while in the asexual reproduction plants are produced by the vegetative propagation, spore formation, fragmentation, budding and fission. In sexual reproduction of plants two main fundamental processes are involved-meiosis and fertilization.Meiosis is the process in which genes are rearranged and number of chromosomes are reduced.In fertilization the complete chromosome is restored to the diploid number. It has been seen that many times plant’s male or female part is sterile. This will ultimately be a hurdle in the plant pollination process. One of the recent study has put light on the the fact that genic male plant sterility can be due to the deficiency of the triterpene pathway. The study further revealed that the mutants due to not have a pollen coat which leads to the conditional sterility in plants.